Home / Unlabelled / Happy holidays! The last couple of months have been without issue. Both brood fish tanks are looking good and fish behavior is normal. Temps are holding at 7 to 8 degrees Celsius. I very rarely feed over the winters - and the last few winters have been particularly cold where we live, with water temps dropping down to between 1 and 2 degrees. this year, temps thus far have been warmer and the polytunnel is probably helping a bit. So, I've been giving them a small quantity of pellet once a week for the last month and I've not observed any deterioration in their health as a result. My winter koi keeping regime is much the same as the summer - I continue with water changes at the same rate and spend time observing the koi too. I gave the Oase Drum's a good clean late Autumn, so ofcourse they're ticking along just fine. The fish newly in from Japan are looking good, and they are half way through the quarantine process. Just heat ramping left to do now. These are the fish my wife purchased on her recent holiday, and last week I popped over to see Mike Snaden at Yume Koi to have a look at the male kohaku he found for me on his recent Japan trip. I asked Mike to find a nissai male kohaku of a level he would consider good enough to breed from. He found a great prospect, and with this male sourced - it will team up with my existing Matsue male (which just won best Kohaku in the recent Kangei Koi Club garden show) to give me a male spawning team of Matsue/Sensuke genetics to play against three kohaku females of different backgrounds. Having Mike's eye help me find the right fish to breed from is a huge support, and I am grateful. I'll be returning to Yume in a few months to collect it. I usually head to Yume on my own, but this time I was joined by a few members of my koi club (Kangei Koi Club) and it made for a great day out. With a bit of time off work over the Christmas holiday period, I plan to kick off a few mini projects. 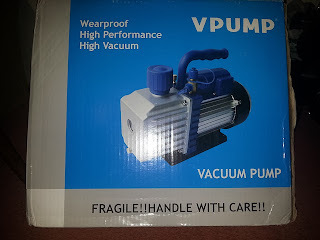 First up will be building the new hatchling selection machine - with the trusty vacuum pump arriving last week I am all set. I'm following instructions received from my Australian koi breeding connection, Allan Bennett. I'll let you know how I get on. 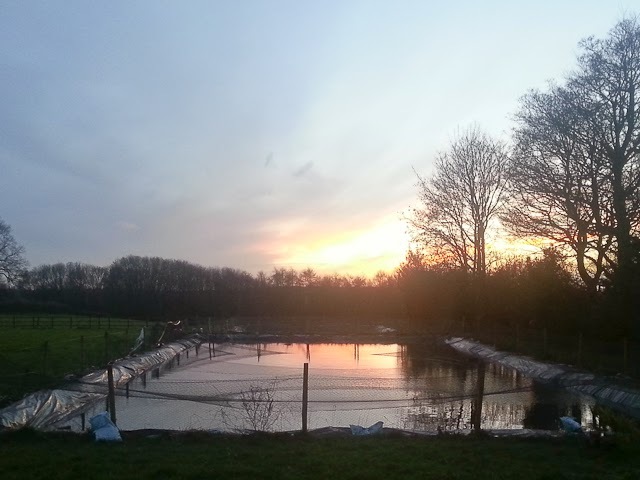 Christmas Eve with the sun setting over horse shoe pond. Those of you who read Koi Carp magazine will have seen the first of my two part series about this project in the edition just out in the shops, and I reviewed the final draft of the second part yesterday. It's looking good! I hope my honesty, sharing the lows as well as the highs provides a realistic view of koi keeping, and my project.